After a year of inflicting deep harm on the people, reputation, and economy of North Carolina, repeal of anti-LGBTQ HB2 is long past due. North Carolina Governor Pat McCrory signed into law HB2 — an outrageous and unprecedented anti-LGBTQ law that eliminates existing municipal non-discrimination protections for LGBTQ people and living wage ordinances and prevents such protections from being passed by cities in the future. The legislation also bars transgender people from some public restrooms and other facilities matching their gender identity. and counting as companies concerned with protecting their consumers and employees have moved conventions, trainings, operations, productions, and other events out of state. Over 200 major business leaders, from Apple to Zola, signed an open letter to Governor McCrory opposing HB2, stating that discrimination is bad for business. The letter was hand-delivered to Pat McCrory by HRC President Chad Griffin, Equality NC Executive Director Chris Sgro and transgender advocate Candis Cox. PayPal CEO Dan Schulman announced that his company would seek an alternative location for its new “global operations center” because of HB2. PayPal’s investment was expected to bring 400 skilled jobs to North Carolina, with an annual payroll impact of more than $20 million. (HB2) perpetuates discrimination and it violates the values and principles that are at the core of PayPal’s mission and culture. "Some things are more important than a rock show and this fight against prejudice and bigotry -- which is happening as I write -- is one of them. It is the strongest means I have for raising my voice in opposition to those who continue to push us backwards instead of forwards." President Obama’s Justice Department determined HB2 violates federal civil rights law, including Title VII of the Civil Rights Act of 1964 and Title IX of the Education Amendments Act of 1972. We see you. We stand with you, and we will do everything we can to protect you going forward. North Carolina State Rep. Darren Jackson proposed a provision to the North Carolina House budget that would repeal HB2 and set aside $2 million to restore the state's reputation. The provision failed. Entertainers continued to speak out in defense of the LGBTQ community -- some moving concerts and events from North Carolina in solidarity. We have announced that we will be canceling our upcoming shows in Charlotte and Raleigh, North Carolina because of the recent passage of the HB2 legislation. This was a difficult decision for us to make as a band... but in the end it comes down to what we feel is morally right. I think everyone should be treated with respect... I hope that everybody gets a chance to be who and what they are. AP reported that the North Carolina General Assembly set aside $500,000 in funds diverted from the state’s disaster relief fund to fight for HB2. Joined by 68 major companies, HRC filed an amicus brief in support of the Obama Administration’s effort to block some of the most egregious and discriminatory components of HB2. The NBA pulled its 2017 All-Star Game from Charlotte. 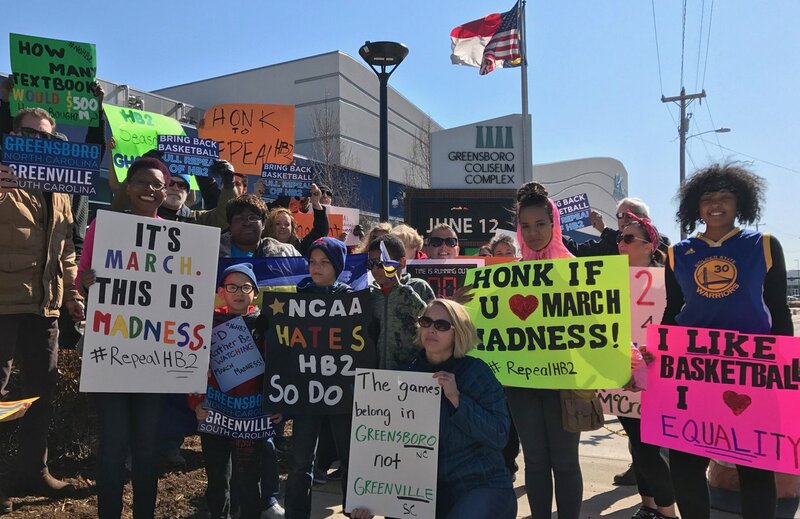 Despite the NBA’s repeated warnings that it would have to consider moving the high-profile game out of the North Carolina if the anti-LGBTQ law was not repealed. Wired reported that the state lost $106 million due to the game’s relocation. I hope they don't put me in a situation where I have to boycott the All-Star Game. We need to move the All-Star Game. I'm all for equal and fair rights and treatment for everybody. Until it gets addressed, until some changes are made, this could be a recurring theme in North Carolina. HRC and Equality NC announced their endorsement of Roy Cooper and deployed an army of grassroots volunteers to turnout the vote in North Carolina! Tar Heelers stood up, and spoke out against hate, division, and fear!
. @RoyCooperNC is a stalwart advocate for LGBTQ equality & we're proud to endorse him for Governor of North Carolina! In Asheville to #turnOUT the vote for @RoyCooperNC. He has the vision and record to lead NC forward as Governor and to #repealHB2! Watch our Youtube spot on Lennie Gerber and Pearl Berlin, a North Carolina couple together for a half century, talk about why Roy Cooper was the best choice for Governor of North Carolina. In North Carolina, where basketball is king, the NCAA boldly announced they would stand up for their LGBTQ players, employees and fans by moving tournament events from the state because of HB2. Wired reported that North Carolina lost $91.4 million in revenue when the NCAA and ACC pulled championship games from the state. ICYMI: UNC men’s basketball coach Roy Williams called the state’s infamous anti-#LGBTQ HB2 law "ridiculous"
50 North Carolina counties who faced LGBTQ intimidation and discrimination attributed to HB2. MUST READ: #LGBTQ North Carolinians share personal stories of how @PatMcCroryNC's #HB2 has enabled discrimination. North Carolina voters took to the polls overwhelmingly opposed to HB2 and ousted Gov. Pat McCrory -- the only incumbent governor from either party to lose on Election Day. Polling released by HRC and Equality NC found that HB2 was the critical issue leading to Governor Pat McCrory’s defeat. to hold a special session where they discussed, but did not act to repeal HB2. During his State of the State Address Governor Roy Cooper reaffirmed his commitment to fully repeal HB2. Attempts to repeal during a special session last year were thwarted by Republican leadership, and now time is running out for full repeal. It is clear that Governor Cooper, like the majority of North Carolinians, is ready to put the nightmare of HB2 in the rearview mirror by repealing this harmful legislation. Since day one, HB2 has been nothing but trouble for North Carolina, and the blame for that lies squarely at the feet of the legislators who refuse to take any meaningful action to repeal it. Governor Cooper is ready to move forward from this debacle. Republican leaders in the General Assembly and the Senate must follow suit.